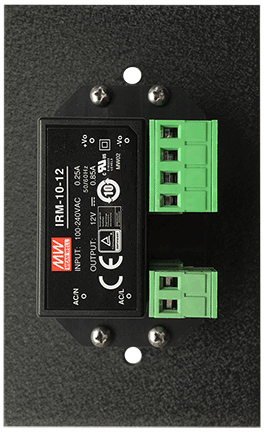 10 Watt miniature power supplies for integration with JSI control stations and other stand-alone low current AV applications. Power supply dimensions (all models) 1.6" W x 2.75" H x 1.06" D are designed to fit inside a standard single gang electrical back box. All supplies are UL rated for an input voltage range from 100-240VAC, encased in a UL94V-0 flame rated enclosure and feature our standard high quality break-away style plug/header for ease of installation. 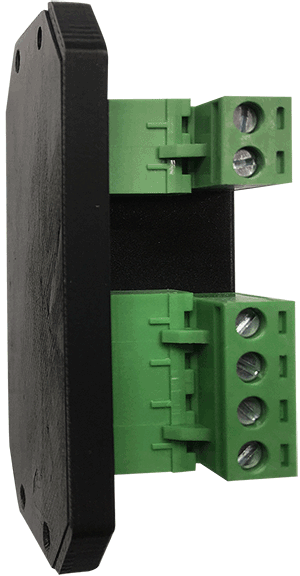 Optional single gang mounting plate available, see #PS-MOUNT below. PS-MINI-3.3 Miniature 3.3VDC 2.5A supply. PS-MINI-5 Miniature 5VDC 2.0A supply. PS-MINI-12 Miniature 12VDC 0.85A supply. PS-MINI-15 Miniature 15VDC 0.67A supply. PS-MINI-24 Miniature 24VDC 0.42A supply. PS-MOUNT-B Single gang mounting plate. Black powder coat finish. PS-MOUNT-W Single gang mounting plate. White powder coat finish. PS-12V50W-2000 12V 50W power supply. Stand alone open frame. Adjustable output from 8.5VDC to 13.8VDC. Dimensions: 8.75" L x 2.45" W x 1.40" D.
PS-12V50W-3000 12V 50W power supply. Stand alone open frame. Adjustable output from 10.8VDC to 13.2VDC. Dimensions: 3.85" L x 3.85" W x 1.4" D.
Used in 3000 Series control systems. PS-DE90 24V Replacement Power Supply for DE90 dimmer rack fans. Set of two (2) 12VDC OEM replacements.